18 months, 13 countries and 6 different languages; in the immortal words of Jeremy Clarkson... "...How hard can it be? ..."
Weather: Due to leaving South Korea at 8 am, I had no idea what the weather was like. Back in Japan, it was overcast with a little rain. Though I knew it would happen, I still wasn't ready for my 4 am alarm. Still, fearing that I would miss my flight I got up, got ready and headed out into the night. With my suitcase trailing behind me, I followed the instructions given to me by the hotel staff and found the 'airport bus' stand with relative ease. Annoyingly, my hotel had told me that the first airport bus started at 5:30 am, whereas the sign here stated 4:30 am. With an hour and twenty minutes drive ahead of me, I only had an hour and forty minutes to clear check-in, baggage, security and immigration; an earlier bus would have been very handy. The airport bus service was every fifteen minutes throughout the day and so I didn't have to wait long; and neither did I have to wait alone. With me was a large group of South Korean tourist I presumed were all heading off together. What was annoying was that, when I turned up, the group only had five members. By the time the bus turned up the group had swelled to around twelve and all seven of the new members felt that it was fine to push in front of me. Fortunately there was enough room on the bus for all, but only just. After another three or so stops the bus stopped stopping due to being full, leaving confused and worried passengers waiting for another bus. Whilst on the bus I decided to reflect on my trip to Seoul. I would have gone to sleep however, the old lady next to me decided to use this journey to call EVERY LIVING RELATATIVE she knew … at 5am! I am glad that I came to Seoul. The experience has been 'full on' and I wished that I'd had another couple of days; not to see any more stuff, but to take my time. If you want to experience Asia, but only have a week-or-so to do it in, then I think Seoul is a pretty good place due to its bizarre mix of extreme modernisation, and poorer areas. It is a city where South East Asia has crashed into Japan; there is rubbish down all side streets with open-tent restaurants and yet, everyone pays for everything by card. For me though, I prefer South East Asia AND Japan because they are separate. The variety of food is fantastic and Korean food, though tasty, is not for me due to the sheer amount of spice. The biggest let down for me were the people. I'm not sure if it is because I'm in a big city – and I find most people in a big city are in more of a rush than people in rural areas – but I found the people to be very rude and unhelpful. Even when I was spending money, I felt as though I was a nuisance to be moved along quickly. Throughout the trip, I really missed Japan's level of customer service. Also … no Soulite smiles ever! My thoughts ended as I approached Incheon International Airport. Amazed at the size of the place I went in with an hour and forty minutes until my flight departed. For some unknown reason, I'd forgotten that today was the last day of the year. I'd thought that, given the time was 7 am, the airport would be pretty quiet. It was nothing of the sort. I raced to my check-in area before queuing up to hand in my baggage. The line backed on itself at least five times though, there were eighteen baggage hand-in desks. It took about twenty minutes to get rid of my luggage. Incheon International Airport had been voted the best 'international airport of 2016' and it's easy to see why. Unlike Seoul, everything was well organised, there was lots of signs and people did queue properly. Sadly though, through back luck, it seemed that whenever I had an option of a 'lane' I always chose the longest. This meant that I finally got to my boarding gate ten minutes before boarding. I quickly went to the toilet and spent the last of my 'Wong' on some over-priced Cadbury's chocolate and a bottle of water. Once on the plane I eventually relaxed. Due to intense cloud cover, the plane experienced more turbulence than the flight going to South Korea. Still, I sat down and ate my breakfast – a hot dog thing – plus I watched most of 'The BFG' before the flight landed safely in Sendai. Surprisingly, Japanese immigration was terribly organised. There was one officer assigned to a long line of foreign nationals, one officer for a medium-sized line of foreign nations with special permission to live in Japan (that's me) and THREE offers for the six Japanese nationals who alighted the plane. The situation was so bad that foreign nationals from the first queue ignored the lady who had organised us and just joined any queue. It took an immigration official to actually come out from behind his desk to get everyone back in line with the promise of a more even spread of immigration officials per traveller. By the time I'd got to 'baggage reclaim', my luggage had travelled around the conveyor belt at least three times. Once done I made my way to the train station and alighted a train bound for Sendai station. I then wasted no time in transferring to the train which would take me home. Once at my apartment, I unpacked, went out to do a little food shopping and had a relaxing – but no way near as nice as the hotel's shower – shower before going to sleep at 7 pm. So another holiday over. Where next I hear you cry. Well, I am not sure at the moment but I do have a sneaky suspicion that it'll be somewhere in Europe. Weather: Slightly warmer than the other days. The day started with a beautiful blue sky however, by mid-afternoon, that had changed to an overcast sky. Due to having a very late night last night, I got up at around 9 am however, I got ready quickly and left my hotel, walking east, at 9:30 am. I decided to visit the market close to my hotel which I'd visited late on my first night here and yes, this time more of it was open. I ordered some market food which was expensive and not very nice at all – it needed some sauce. Once that 'must do experience' was over, I proceeded to my next culinary 'must do experience'. Issac toast is a fast-food restaurant selling, you guessed it, toast. It is apparently a very popular breakfast and so I ordered the ham and cheese toast which, was cheaper than the market food, and tastier … but only just. The bread was ridiculously sweet making it quite hard to stomach. With that done, I found myself within the Dongdaemun area which had a nice hill and a lovely church just behind it. I climbed the hill to get a panoramic view of the city below. This part of the city was certainly very modern due to the beautiful new shopping centres and skyscrapers which lay before me. It was so modern that, when I went to the toilet in one of the 'posh shopping centres' there wasn't a 'poo bin' (South Korea's plumbing isn't spectacular therefore, tissue paper of any sort is not allowed to be flushed down the toilet … meaning that toilets have bins where people put their used tissue … lovely).With little to see in this area, I didn't stay long and soon I was on an underground train bound for an area of Seoul called Gangnam. Once again, pushing onto the train seemed the order of the day and when I showed my shock through suggestive gestures, a Korean woman just laughed at me as if to say 'this is Korea'. Now, you may have heard the name 'Gangnam' before. It was, of course, the name of the 2012 hit-single by PSY. The song has over 2.3 billion views on 'You Tube' and is a musical assault on the hollowness of Korea's richest neighbourhood – Gangnam – and the phoniness of those who aspire to live here. As the song put the area in a bad light, you would have thought that any mention of the hit 'Gangnam Style' wouldn't have been mentioned within these modern streets and yet, as I exited Gangnam station, there was a public piece of art dedicated to the song. With that photographed I proceeded along the main street, which looked as though it had been transported directly out of New York. The buildings were high and the advertising was enormous. What's more, even the side streets here didn't look like they were from the 1950's; everything seemed pretty new. Once I'd had a good look around, I'd purchased some McVities biscuits - which I couldn't get in Japan - and found the restaurant I'd wanted to have dinner in however alas, it didn't open for another hour and a half. I therefore went to a 'Taco Bell' restaurant which, all of my American friends praise highly (however, I couldn't see what all the fuss was about), before deciding to leave the area determined to come back to my restaurant. I would be leaving to visit South Korea's Olympic Park however, before that, my guidebook had highlighted the fact that Gangnam housed Samsung's headquarters and with that came a store called 'Samsung D'light'; a store showing the electronic products of tomorrow. I went in and discovered some crazy stuff including a round cylinder PC and a beautiful interactive plasma TV. I also tried on some virtual glasses which were amazing! Once I'd finished playing I headed back into the underground station and off I went to the Olympic park. I'm not sure if it was all the 'inside', then 'outside', then 'inside, then 'outside movement … or all of the train journeys … or the differences in temperature I was experiencing however, I was starting to feel unwell. I had a huge headache which would occur every-so-often. It was weird but, sometimes I would feel dreadful and then, twenty seconds later, I would feel fine. 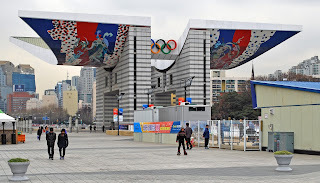 I therefore decided to make my visit to the Olympic Park brief before returning to Gangnam for something to eat to see if that made me feel any better. South Korea hosted the 1988 Olympics and at its centrepiece was the 'Olympic Peace Gate'; a colossal gate with two huge wings painted in a traditional Korean style. I marvelled at its beauty and took a lot of photos. Feeling better I walked through the gate and past an ice rink where a lot of skaters were having fun. I proceeded to where the flags of all the nations who took part were placed. Being that 'peace' was the overall theme for the Olympics, I was surprised to find that the North Korean flag was missing. There were also a couple of interesting flags including East Germany, the USSR and two countries that I have never heard of; 'Figi' and 'Great Bretan'. Still, if I was using the Korean alphabet I'm sure that I would have trouble to spell a single word, let alone country names. Once I'd seen the flags I walked back through the peace gate and back into the underground. I was back in Gangnam within twenty minutes. I made my way to the restaurant I'd wanted to eat at earlier and discovered that, though it was open, I was the only diner. I still sat down and ordered. This restaurant was famous for fried chicken and so I ordered the 'fried chicken with soy sauce and spices' … which was delicious. After paying I left Gangnam for the final time and proceeded west to an underground stop called Noryangjin which, I thought, would be a good place to see the Hangang; Seoul's main river. Within the station I met a tourist information officer who explained to me that I'd chosen poorly; he showed me photos of a 'rainbow bridge' which was a few stops north-east, on the other side of the river. I didn't ignore his advice; instead, I saved it for later. I went back into the underground station and kept going west due to the fact that, before arriving in Seoul, I'd read my guidebook and I'd highlighted a small island two stops west of where I currently was. The name of this island was Yeouido. Though in it's past this island wasn't particularity favoured among Seoulites, it has grown in appeal and today it has a rather modern feel to it due to a lot of apartments. I exited at the island's most southern station and walked twenty-or-so minutes north-east to where the island stopped. The walk wasn't that interesting however, once I'd hit the northern coast the night view over the river and into the heart of Seoul was worth the effort. What's more; on the key there were lovely lights, food stalls and a Christmas market. I had a good look around, purchasing some more spicy Korean food and visiting the Christmas market where there were quite a few things I could have purchased. This view over the Hangang river has become one of the highlights of my entire trip because it was so unexpected. Sadly though, I still wasn't feeling great and so I made my trip short. I went away from the coast and into Yeouinaru station; from there I went back to Myeongdong to do a bit of last minute shopping. Once I'd finished in Myeongdong, I really should have gone back to my hotel due to how I felt and the fact that I had to be up at 4:30 am tomorrow to get a bus to the airport. Annoyingly this 'rainbow bridge' was still playing on my mind and so after umming and arring, I decided to try and find it. I got to the station I was told to go to by the tourist information officer however, after exiting, I discovered that it was such a long walk away I gave up and went back into the station annoyed that I'd wasted a good forty minutes. I got back to my hotel late again and so, all of the restaurants were closed. I therefore had no option and went back to 'Tom and Tom's cafe' for a lasagne and a lovely cheesecake. As I headed back to my hotel I stopped, for the final time, at the local convenience store and bought every Twix he had left (seventeen of them to be exact). With that I went to my room, ate my dinner, took some tablets and packed for tomorrow. It was almost midnight before I got into bed and I would have to be up at 4:30 am tomorrow. Seoul, through its mix of old and new, had half killed me; I wasn't feeling very well, I was tired and yet … I'd achieved a lot in three days and I'd had a good time. Plenty of time to rest once home. Weather: It had snowed lightly last night giving every building in Seoul a beautiful, light sugary cover of snow. The day was a little cold due to a light breeze but there was still a beautiful blue sky. Having gone to bed early the night before, I found myself wide awake at 7 am. 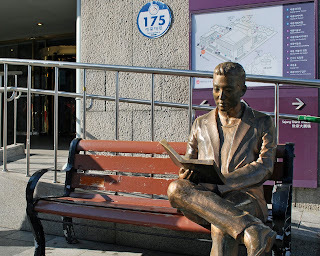 Once again I decided not to pay for breakfast at my hotel and instead, I waited until I reached my destination for the day; Jeongdong … the central district of Seoul. Instead of walking, I used my rail card for the first time (and interestingly, my card was docked 1,275 Wong (85p) when I went through my first ticket barrier and NOT when I went through my last. This meant that no matter how far you travel on the underground; no matter how many changes you make, as long as you don't go through a ticket barrier a journey will always cost the same amount no matter how far you travel). Though being respectful to your elders is very important in South Korea, it would appear that queuing is not. As I went to board the train Koreans of all ages pushed in front of me and my elbows had never been so busy. I alighted at the 'city hall' stop and, once at street-level, I got my bearings. I found myself looking across a large circular area of snow-covered park land. In front of me was a hotel, (the President) which I'd almost decided to stay at, and around it lots of tall skyscrapers. To my right was another huge hotel with a beautiful Christmas tree outside. To my left was the city's library with the city's new city hall directly behind. 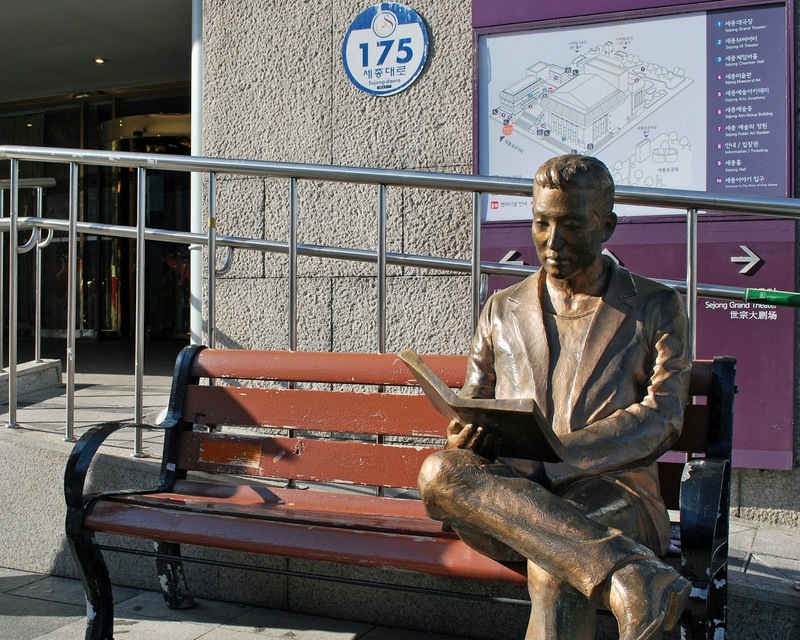 The library is one of Seoul's many colonial architectural buildings and most of these buildings are within this area. They were built within the Japanese occupation period of 1910 – 1945 and were built along Neoclassical lines, although there are splashes of Art Deco as well. Understandably, a lot of the buildings built during the occupation period have been pulled down or destroyed and, it is said, that some Koreans are not too fond with the buildings which remain however, these buildings are now protected and, I think, it is a good thing too as a) they are some of the prettiest buildings in Seoul and b) they are still a part of the cities history whether that history is good or bad. What is interesting is that these colonial buildings were the tallest buildings of their day and this was on purpose; it was to remind the Korean people who were actually in charge. These days these buildings are choked by a lot of skyscrapers humbling them. As mentioned above, the new city hall is directly behind the old Japanese colonial library and the city hall has been designed to look like a wave, towering over and washing away Seoul's colonial past. My first stop was a 'Dunkin Donuts'. I ordered a doughnut, a hot chocolate and a 'cheese and ham bake' which was okay however, I preferred yesterday's sandwich. Whilst in 'Dunkin Donuts' I studied my map and made a plan. 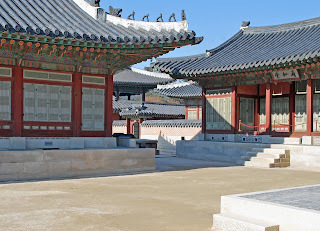 I would visit the small palace of Deoksugung first before walking around the area taking in all of the buildings. I would then leave this area and head east through Namdaemun Market and into Myeondong; Soul Korea's main shopping area. With that decided I left 'Dunkin Donuts' and made my way to the palace. As today was not 'South Korea's Day of Culture', I had to pay to get in. Once I had my ticket I slipped cautiously past the guards - who were again in traditional clothing - and went through the first gate. Paying wasn't as much as of an annoyance as you may think; it reduced the amount of people looking around the area enormously. Compared to yesterday's palaces, this one was tiny though no less interesting. This complex had both Chinese-looking ancient buildings and Japanese-colonial buildings; along with the snow, it was a joy to photograph this area. Once finished, I left the palace and walked around the area taking in all of the embassies and staring up at the skyscrapers. I also managed to find the area the demonstrators were currently camped and therefore, I saw the gate to Gyeongbokgung palace I'd visited yesterday. Finally, it was time to leave this area and so I headed south-east, past the city hall once more and past a beautiful ancient Korean gate called 'Namdaemun'. Near to this gate was a Korean sweet shop called 'Bizeun'. My guidebook had highlighted it due to the fact that this shop made traditional Korean sweets and, though they didn't look as delicious as chocolate, I felt that they would make an interesting gift for my work colleagues. I decided to return later. I had now left 'modern South Korea' and was now entering Namdaemun Market; a chaotic area of street stalls, boiling food products, shouting and motorbikes winding their way through pedestrians. The place was packed and, as most things on sale were either clothes or food, I chose a road and just kept walking east until I left the market, occasionally stopping to examine goods in more detail. This market was a maze of small side streets and hidden building entrances with three or more floors of stalls. You could have spent a whole day here and still not have seen everything; it was crazy and my senses were on full alert. Once out I'd made it to the area of Myeongdong; Korea's main shopping area. Some Japanese visitors spend their entire trip within this area, never leaving Myeongdong's borders and it showed due to a number of Japanese signs splashed all over the walls. The area seemed to be focused on only two products; clothes and cosmetics, neither of which I am particularity interested in. I therefore used my guidebook to find a 'famous restaurant' and went for lunch. The restaurant was packed with people and miserable-looking waitresses. I was abruptly shown to my table and then, five seconds later, I was asked what I wanted to order (I hadn't even sat down). I apologised and quickly opened the menu. I spent a minute or so deciding what I wanted and placed my order whilst apologising again for no reason whatsoever. I'd ordered ten dumpling things and a spicy soup; again the blandness of the dumplings went well with the spicy soup. Once finished I paid for my meal before returning to my table - to pick up my bags and coat – to see that all of my plates had magically disappeared. It was then that a different miserable-looking waitress approached me and asked bluntly what I wanted to order. I apologised again and told her that I'd already eaten. I then ran out of the restaurant. Back in the streets of Myeongdong, I went back into 'modern South Korea' by entering two very expensive looking shopping centres. I skipped the clothing sections and took the elevator down to the basement to look around the food area. I bought some South Korean chocolate. Through with shopping, I left the shopping centres and found the traditional South Korean sweet shop (I spent £50 on eight boxes of sweets for my five schools). I then slowly made my way to Seoul's main train station where I collapsed within another 'Dunkin Donuts'. 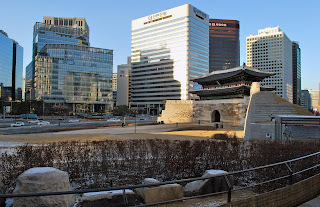 Once refreshed, I decided that I would head back to my hotel to drop off all of my shopping (each box of sweets weighed 200g) before I would head back out at night to go up Seoul's Tower. I left Seoul's main train station at 5:15 pm and arrived back at my hotel at 6 pm. After a quick freshen-up, I left my hotel at 6:30 pm and made my way back to Myeongdong; which is where the entrance to the tower is. Darkness had fallen and the night sky was perfect; there wasn't a single cloud in the sky. Sadly everyone else in Seoul had thought the same and the queue to get into the cable car was horrendous. The cable car took me up a small mountain which is located directly in the middle of the city of Seoul. Once the cable car had stopped, I found myself at the base of a modest-looking tower (though, due to being planted on the top of a small mountain, the tower was the same height as Tokyo's Skytree). I then joined another huge queue which took me up to the observation deck. Before reaching the observation deck, I had to deal with one of those stupid people who take a photo of you in front of a green screen, before planting it onto a fake background of Seoul Tower. If that wasn't enough, the elevator roof had a stupid fake video. As the elevator ascended up the tower, the video showed us bursting into space, flying around an asteroid belt and landing on an alien planet with Seoul's Tower sticking out of it. As you can imagine, I was quite relieved to arrive; I then spent my time gazing down onto the city of Seoul. Though the glass windows could have done with a clean, the view was amazing. Seoul was lit up like a Christmas tree and I could even see my hotel. I very much enjoyed taking in the view and I also enjoyed looking at the glass, as the names of different major cities were written on the glass with how many kilometres away they were. I spent a good forty-five minutes at the top of the tower before, reluctantly, joining another huge queue to get down. The lift performed the same stupid video but in reverse however, mercifully, the cable car had no stupid 'fake' special effects. Once back in Myeongdong, I checked my watch … 10pm! Due to the sheer amount of people, it had taken three and a half hours to go up Seoul's Tower. Annoyingly, once back near my hotel, most restaurants had closed therefore, I found myself in 'Tom and Tom's cafe' ordering whatever they had left (though, not until the waitress had finished her text message). It took twenty minutes to receive two pepperoni pretzels. I thanked the waitress and took my food out of the cafe. I visited the local convenience store for a twix before getting back to my room at 11:20 pm. I ate dinner, had a shower and collapsed on my beautiful king-sized bed. What a day! Weather: Cold but with beautiful blue skies. I woke up at around 8 am having had a wonderful nights sleep. When I booked this hotel, quite a few reviews suggested that the breakfast served wasn't worth the cost therefore, I headed out into the city walking west towards the centre of Seoul and, coincidently, towards Seoul's historical area where I'd planned to spend most, if not all, of my day. Having had spicy Korean food last night, my stomach yearned for something a little more forgiving this morning; the first restaurant which appealed to me was Burger King however, once inside, the payment system seemed to be completely electronic and only allowed for payments by card. I therefore left Burger King and found a Subway. I ordered a lovely chicken sandwich which, though expensive, was exactly what I felt like eating. Speaking of money; yesterday I'd paid for my hotel and my entire trips transport costs. I knew that this would happen however, it was still a shock when I looked into my wallet. Therefore, after breakfast, I headed to a bank to change a little Japanese money I'd brought with me in case I needed it. Once fed and resupplied with cash, I proceeded on foot to my first attraction for the day; Gyeongbokgung. I didn't go there directly; instead, I meandered my way through the side-streets slightly perplexed by how the main streets could look so modern, and how the side-streets would have been more at home in Cambodia. Seoul really is a city where two economic worlds have collided. Once at Gyeongbokgung palace, It's main gate - Gwanghwamun – had three archways protected by five guards in historical clothing and armed with historical weaponry. I proceeded through the right-hand archway and looked up at the beautiful wooden ceiling with two painted dragons circling one another. I was enjoying photographing the ceiling so much that I failed to keep track of the time. Why is this important you may ask? Well, at 11am there is a 'changing of the guard' and, as I looked away from the ceiling and back the way I'd come, the five guards were marching towards me with a stern look on their faces which I read to mean that they weren't getting out of the way for anyone. Surprised to find that they hadn't marched down the centre archway, it took a second for me to leap into action and I bolted to the end of the gate. In front of me I had two options; I could keep running straight into the open courtyard area which leads to the inner gate – a large area for me to run away from them however, I felt as though the guards would be heading this way as I thought that they must be heading into the palace – or I could turn right and hug the outer wall. I turned right … only to find that the guards also turned right. I was then forced against the wall as the guards marched past me. Once gone I took a second or so to compose myself and to look around to see how many people had witnessed my misfortune. I then proceeded to the ticket counter to find that today was Korea's 'Day of Culture' and therefore, this site was free to enter. I then went through Heungnyemun; the palaces' inner gate. Gyeongbokgung palace is the city's most popular tourist sight and is a focal point for the country as a whole (which was evident due to the recent demonstration against South Korea's president being just across the main road from the palace). 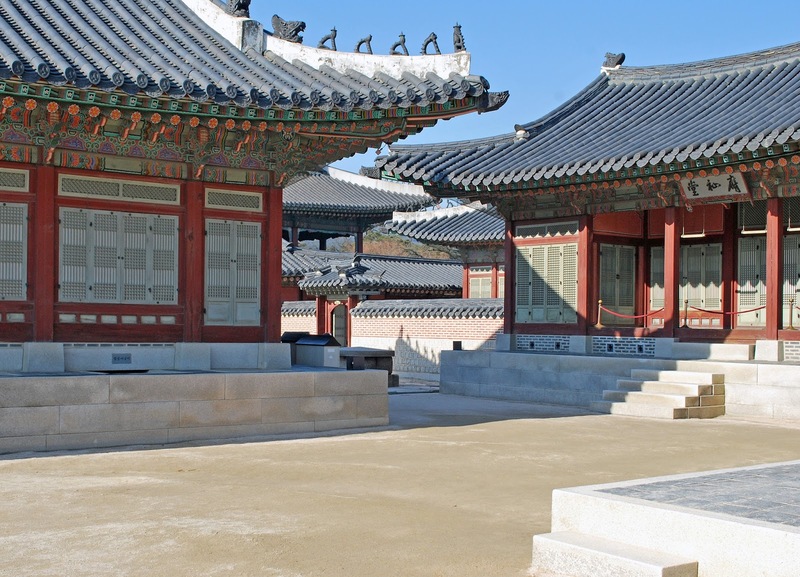 This palace – named the “Palace of Shinning Happiness” - was commissioned by King Taejo in 1394 to house the royal family of the Joseon dynasty shortly after they transferred their capital here in 1392. It was completed in 1399 and held the regal throne for over two hundred years. At the peak of its importance, the palace housed over 400 buildings. Within its history, the palace has witnessed countless fires, military destruction and even a royal assassination therefore, all of the buildings have been rebuilt in a massive 'forty-year' campaign (which started in 1989 and is still on-going) to get this palace back to its former glory. Having had twenty-seven years of construction time, a lot of it had been rebuilt and it was a joy to move through the inner courtyard and to see architecture which had a very Chinese feel to it. I then proceeded out the back of the temple and into the gardens where I saw the 'Hyangwonjeong'; a pagoda in the middle of a frozen pond. It was within this area that I was approached by seven Korean girls all wearing 'chima jeogori' ('Google it'; it's a beautiful Korean dress). They asked if I could take their photo to which I said yes. What was really weird was that they were all smiling and, actually, seemed very happy indeed. This was bizarre because all of the Koreans I'd met so far were miserable and sounded as though they were continually having an argument. All became clear when I asked where in Korean they were from … Thailand. Once out of the palace grounds I proceeded back east towards another large palace called 'Changdeokgung' (I hope that you are having fun pronouncing all of the names). On the way, I stopped at a 'Dunkin' Donuts' for a lovely hot chocolate and a doughnut. I could have had lunch however, 'attraction opening times' was short and I wanted to see this other palace. Once I'd finished my snack, I left the doughnut shop and proceed to the entrance of the palace. Yet again the palace was free to enter however, I paid 5,000 Wong (£3.40) for an English guided tour of 'The Secret Garden' (you weren't allowed to see the garden without going on a tour). Whereas Gyeongbokgung Palace was destroyed long ago, Changdeokgung Palace was home to royalty until very recently – 1910 – making it the best-preserved palace in the city. Its construction was finished in 1412 and was commissioned by King Taejong. It has more of an international feel as some of its buildings are a direct image of Chinese ones. The palace was lovely and now being late in the day, I seemed to be the only one around allowing for excellent photographing opportunities. My favourite complex of buildings was so packed that it was pretty easy to lose your way and get lost. Once I'd seen each area of buildings – bar one – I proceeded to the meeting point for the English tour and got their five minutes before the start. For me, this garden was a little bit of a disappointment however, this was no fault of the garden itself. My guidebook talks of beautiful flowers and lotus ponds however, being winter, all of that colour was in hiding, preparing for the next summer. I was left with the 'bare-bones' of the place … which was okay but didn't give the impression of a garden which, in the 1400's, only the royal family of Korea could visit (everyone else was banned). The guide also wasn't that great as I could only understand about two out of ten English words she was saying. I therefore gave up listening to her – along with a lot of the group – and just proceeded to take the best photos possible. Once the tour had finished, I proceeded back to the area of buildings I'd missed before exiting the site. The time was around 5 pm and my feet were knackered. I headed back to the 'Dunkin Donuts' shop I'd visited earlier for another hot chocolate and spent a little bit of time resting my feet and creating a plan. Eventually, I decided to stay within the area I found myself in due to my guidebook stating that this was an excellent place to buy souvenirs. I proceeded to a street full of souvenir stalls and had a look inside most of the shops including a souvenir complex with four floors of stalls. In the end, I opted to return to a shop I'd entered earlier to buy my souvenir. I chose this shop due to the fact that, in a lot of other shops, I was continually hounded by the staff to buy something … in this shop I was left alone. I walked away with a nice Korean wooden box for £26 before heading into an area of small side-streets with hundreds of 'tent-like' restaurants all serving 'Yakiniku' (small slivers of meat which you barbeque). I chose one restaurant and, after pointing at many different photos, I had a table full of food plus a coke. The food was very nice; unknowingly, I had managed to order a nice mix of spicy and non-spicy dishes which complemented themselves well. Whilst eating I peered out of the window and watched the chaos unfold outside. Driving in Korea is almost suicidal as cars consistently change lanes and cut each other up; this results in the horn being used a lot and with most drivers having blacked-out windows. Tents were billowing with steam and shouting could be heard from all over. Seoul is an intense city of both poor and rich; I currently found myself in what seemed like a chaotic Malaysian food district … and I was loving it. I finished eating at around 9 pm. I decided to walk back to my hotel as it was only a thirty-minute walk away. Like Japan, Korea is a pretty safe country with low crime levels however, unlike Japan, it didn't feel like it therefore, the walk back felt a little scary. Once back in my hotel, I took a long shower before proceeding into bed with my guidebook. I went to sleep wondering where I would be heading to tomorrow. Weather: Cold and cloudy but not too windy and no rain. Now, usually when I start a new trip the first paragraph usually explains how I got up at the crack-of-dawn to drive to somewhere or to get an early train; not this time. In fact, on this trip I didn't even set an alarm and therefore, I got up at 10 am with still time to spend. I got ready, checked my apartment one last time and headed to my local train station. The train would take me to Japan's sixth largest city – Sendai – where I would change onto a train bound for Sendai International Airport. My flight was a 4 pm and I arrived at 1:45 pm; fifteen minutes before checking-in even started. Using the words 'International Airport', makes Sendai's airport sound quite grand however, it's a tiny little place with only six or seven gates. There is a tiny food court and just one duty-free shop, making the whole place seem quite cute though, there was still everything you could possibly need (even if it is lacking in choice). I made it through security and immigration with thirty minutes spare before boarding. Today I would be heading to Incheon Airport; South Korea's main International Airport. It would take around two and a half hours to get to Incheon, and then who knows how long it would take to get to my actual destination; the city of Seoul. The flight was fine ... apart from the film I chose; wishing to be teleported back to my childhood, I made the error of selecting 'Independence Day 2', which was terrible and what is more horrifying is that the film ended with an incomplete storyline allowing for possible future expansions. I was also given a late lunch / early dinner meal pack which was nice, but so unexpected that I'd already eaten before boarding. Still, I'm not one to turn down free stuff, so I ate it anyway. Once eaten the pilot notified us that we were about to descended and we touched down just as Independence Day 2 finished. Incheon International Airport could not have been more different to Sendai's airport. It was huge; so-much-so that a train had to take me from my departing terminal to immigration and baggage reclaim. After an hour or so I'd made my way through the airport's security and was now heading towards the airport's underground train station. I purchased a 'one-trip ticket' which included a transfer at Seoul's main train station and allowed me to travel all the way to my hotel. Once I'd arrived at Seoul Station, I was almost immediately reminded that I was currently in a country still at war and that, the city I was in, was only 30kms from the front line. Within the station there were cabinets of gas masks, fire extinguishers and food supplies. Though most Koreans just walked past these cabinets, I found them extremely interesting (on later train journeys I would watch safety videos in regards to what to do if Seoul was attacked). Before changing trains I decided to buy an 'electronic rail card'. My guidebook had told me to buy one and fill it with money. This would then allow me to use Seoul's underground at will, without ever having to queue up at a ticket machine (the card also made each train journey cheaper and, once my holiday had finished, I could hand the card back and get a refund on all the money I hadn't used). Conveniently, there was a convenience store and so I went in and bought a card from a miserable looking Korean assistant before 'topping it up' with 30,000 Wong (about £20) which saw me through my trip. Were my eyes deceiving me? On the shelf … in the convenience store … I thought I saw …. Yes! I did see it! … A TWIX!! A lovely, lovely king-sized Twix for only 1,700 Wong (£1.14). Now; I am sure a lot of you are wondering what the big deal was. I mean, it was only a Twix. The fact is, is that you cannot buy a Twix for love nor money in Japan. It has been a good two years since I had eaten a Twix and now, hope was rising inside me … maybe Korea had Maltesers too! I waited in line behind a man using his credit card to buy a 90p pack of chewing gum, before I got served by the same miserable-looking assistant. I then went and boarded the train bound for my hotel. I spend the entire trip prodding my new Twix bar … making sure that it wasn't a dream. Five stops later and I had arrived at the closest stop to my hotel. The street was pretty quiet with only a handful of shops still open and a few small stalls selling street food. A few ominous-looking people were out walking around and I over-heard my first Korean conversations which sounded like an argument. I made it to my hotel at 9 pm; two-and-a-half hours after I'd landed. I quickly went up to my room where I unpacked and organised my stuff for the days ahead. The price of my room was a little high however, my room had three amazing features. Firstly, it was lovely and warm, secondly there was a huge bed which looked extremely comfortable but, the best bit of all, was that the bathroom had a rain shower … heaven. I left my hotel thirty minutes after entering it. I went across the street to Seoul's biggest market which, my guidebook stated, operated twenty-four hours a day. Sadly my guidebook also stated that only parts of it were open late at night and those parts didn't look very welcoming. I was hungry, and there were food stalls with middle-aged Korean women heckling me to try their produce however, I wasn't feeling that adventurous just yet. In the end, I opted for a small restaurant close to my hotel which seemed to be open all hours. They had a handy picture menu however, just like the convenience store assistant, neither the waitress nor the cook smiled or even looked remotely happy to see me. I therefore apologised for giving them money and eat my red-hot soup as quickly as possible. Now you may be thinking that Indian or Pakistani food is spicy; seriously, it is not a patch on Korean food. As I ate mouthful after mouthful I was amazed how this concoction had not burned it's way through the bowl it was served in, through the table and through the floor. I ate as much as I could before apologising for reasons unknown and quickly left the restaurant wishing the other diners good luck. I went back to my hotel to have a lovely hot shower and climbed into my glorious bed. So my first day had all gone well through I feel as though – due to not having any local knowledge – that I'd wasted time (the hotel's receptionist was surprised that I'd taken the airport underground train here and not the bus as the bus was quicker). With my rail card in hand and 'topped up', I felt ready to rectify the situation tomorrow. Due to not a lot happening, I've decided to put both Saturday and Sunday together as one blog post. As a quick summary; on Saturday I travelled from Takamatsu over the bridge - just to the west of Takamatsu - to Okayama. From there I turned east and into Himeji. From then on I went north until I hit the northern coastline, when I turned and headed east again. I skipped under Fukui and took the same road I'd come in on – the 158 – all the way to Matsumoto. From there it was just a short trip across some mountains to my over-night stop of Ueda. On Sunday I went east and crossed even more mountains before taking the '17' all the way north to the '252', which took me over even more mountains and into Aizu-Wakamatsu. From there I crossed over my final mountain range before driving around Fukushima and ending up in Sendai – my home – at around 3pm Sunday afternoon. The below will add flavour to that journey. Saturday 20th: I slept 'okay' last night. The bed was comfortable enough and I had exhausted myself with my days excursion to Nao-Shima. Therefore the only thing keeping me awake were my noisy neighbours. True the time was only 8pm however, I got out of bed and opened my door to see some of them chatting in, I think, Chinese. They said sorry. I could still hear them during the night until 1am – when they seemed to have gone to bed – however, it now wasn't loud enough to disturb my slumber. I woke up at 1am and got ready as quietly as possible. Due to having packed the night before, I found myself in my car and ready for the off at 1:50am. I proceeded out of Takamatsu as fast as possible however, traffic lights still plagued my journey. I made it to the bridge crossing around forty minutes later. It was a shame I couldn't see anything however, the bridge itself was all lit up and I did enjoy that. I also felt that it was worth it and now, having arrived on Honshu's southern coastline at 3am (though £20 less due to the bridge's charges), I felt that I could risk travelling along Japan's congested southern coastline until I hit Himeji. My previous plan had been to leave Takamatsu at a 'normal' time and, once across the bridge, head north to Tottori as fast as possible however, with very few roads heading east from Tottori, I felt that going along the bottom of Honshu to Himeji could save me as much as three hours! I could tell that the '2', at any normal hour, would be jammed solid of traffic. This wasn't a normal hour. I flew along it, all the way to Himeji where I saw a dark silhouette of the castle as I drove past. I then headed north – stopping for a little bit of fuel – relieved that my gamble had paid off; I'd left the southern shores whilst it was still night. After heading north for a while I then had to cut east. I choose the '412' as my 'eastern road', as it looked like a normal road which was used daily. Not long after I'd turned onto this road did I realised that this road hadn't been used for quite some time. It would appear that, to use this road, I had to help cut back the bushes and long grasses which were trying to smother it. What was worse was that the road wound it's way up a mountainside and had no protective barriers from the drops. I was so glad that it was now light as, if I'd driven along this road at night, things could have been a lot worse. I concentrated hard as I pleaded for the road to end … I hardly remember blinking. Once off the '412' I met up with the '153' which I'd used just less than a week ago to get to Shikoku. This took me all the way to the coast where I then headed east along the '27'. Unbelievably I found myself sixty kilometres south of Fukui at 10am … only eight hours after I'd set off (going from Fukui to Shikoku took ten hours … and that was a shorter route). I stopped for lunch before getting on my way again. Once again I fell foul of trying to get over / around Japan's central mountains in order to get onto the right road which would take me to Matsumoto (a city near my night-stop). It took an hour or two just to get myself aligned so that, at midday, I finally found myself joining the '158' which would take me all the way to Matsumoto. This is the road I'd used to get to Fukui and I remembered what I'd learnt from that previous journey. For example, I did not drive through the centre of Takayama – though I did get lost trying to find the by-pass (I hate cities!!!). By 2pm I'd past Takayama and things were going well; I was only eight kilometres from Matsumoto and my speed was looking good … that was until I hit Kamikochi. Kamikochi is a beautiful national park – high in the mountains - which I've visited before (check out my blog). Unfortunately, I'd managed to drive past the park at the same time as everyone else was trying to leave. Scores of coaches, buses, mini buses and cars were all trying to work their way along the '158' – a single lane mountainous road – towards Matsumoto. The views were extremely beautiful however, nothing could lighten my spirits … my speed had decreased to thirty kilometres an hour. I finally arrived on the outskirts of Matsumoto at 4:00pm … the time I'd wanted to arrive at my hotel in Ueda. Sadly, the town of Ueda was still forty kilometres east of Matsumoto: i.e. on the opposite side of Matsumoto to where I was. This meant that I had to drive through the city itself, as there was no by-pass. Time ticket away. By 5pm I'd left the city of Matsumoto and was trying to reach Ueda as quickly as possible. You see, my plan was to get to Ueda at 4pm having filled up my car and having eaten tea. I could then write this blog and, hopefully, go to sleep at 6pm. It was 6pm – after having travelled over ANOTHER mountain range – by the time I hit the outskirts of the city. Yes, city! When I looked at the map, I thought Ueda was a small town but no, looking at the city as I came down from the mountains showed it's true extent. I filled up my car and ate dinner quickly. I then discovered that Ueda's road system was stupid, and that the whole city is practically grid-locked each and every night. Finally, heroically I made it to my hotel … to discover that there car park was full. I then drove to their 'secondary car park' and walked back to the hotel. In my room, I only took out things I needed from my bags before cleaning my teeth and crashing on my bed at 8pm. I was going to get up at 1am again however, due to getting into bed two hours later than I'd planned, I decided to set my alarm for 2:30am. Anyway … tomorrow is a Sunday … should be dead on the roads. Sunday 21st: DO THE JAPANESE EVER SLEEP! I got up at 2:30am and left one hour later. Within twenty minutes I found myself stuck behind a lorry going up a mountain road. Thankfully, he let me by quickly. I didn't find another lorry going in the same direction as I however, hundreds – including a tractor – were going in the opposite direction. I'm not sure how high Ueda is from sea level but, the road kept going down for mile after mile. I checked my map just to make sure that the next 'place of interest' wasn't the centre of the Earth. Finally, with dawn approaching, I made it into a valley where I picked up the '17'. I know that there are many wonderful sites in the world however, driving through Japan's mountainous heartland when dawn breaks has to be up there. I know I haven't mentioned it a lot but, I hope as you read this blog, your mental image is of me driving down some windy road with beautiful mountains all around me because … that is exactly how it was. I took the '17' north and put my foot to the floor. The '17' was one of the main roads to – and from – Tokyo therefore, I wanted to get off it before 7am / 8am. By 8am I'd just made it to the '252'. This road would take me across yet another mountain range to Aizu-Wakamatsu. This is my favourite road in Japan because, unlike a lot of mountainous roads in Japan, it doesn't skip the top of the mountain by having a large tunnel half way up it. At 9am I found myself out of my car, on the top of this mountain, looking down at a valley of lakes with beautiful small wooded islands. The view was exceptional and, I wasn't the only one who thought so; a Japanese gentleman and I passed the time of day as we just looked at the valley below us. I made it to Aizu-Wakamatsu at 10am. I was starving and ready for lunch however, none of the restaurants were open yet. I therefore had no choice; I opened my last packet of 'Animal shortbread biscuits' and drove out of Aizu. I drove up another beautiful mountain range before coming down onto the outskirts of the city of Fukushima. I skipped around it and, once on the '4' (the main road to home) I stopped for the final time for lunch. The drive from Northern Fukushima to Sendai occurred without incident. Last time I drove down this road, I was going to Fukui and it was pitch black. It was nice to be able to see where I'd travelled. I finally arrived home at 3pm. Once I'd parked my car, a flurry of activity occurred with me unpacking bags, doing laundry and repacking bags (I am off to a friends house tomorrow for two nights). So there it is; my trip to Shikoku. Yes, it was hot. Yes, there was a tone of driving and yes, the traffic and traffic lights were unbearable at points however, I would give anything to be back there right now. I did manage to see everything I wanted to however, it would have been nice to have a few more days just to enjoy it ... and to be able to slow down a little. In December I have, what is possibly, my final holiday in Japan. I would like to see Western Honshu (around Hiroshima) but whether I will, I am not sure. The drive is a little bit less than to Shikoku – only by three or four hours – however, it will be during winter and so a lot of the mountainous roads will be closed (meaning that I … AND EVERYONE ELSE … will have to drive along the coast). I could put more night-stops in … I could use the highway … I drive through the night. At the moment I'm not sure; I need to relax from this trip, take a breathe, and then get my calculator out and work out which method of getting to Western-Honshu would be the best for me. Weather: Sunny and very, very hot. Due to wanting an early night tonight, I prised myself out of bed at 5:00am. Though this hotel is – and feels - very cheap, I actually slept really well. Once I'd got ready I finally left the hotel at around 6:45am. The sun was still young, making a huge difference to the temperature. As I walked towards the centre of town, it was positively cold by Shikoku's standards. Not wanting to waste the cool weather, I put on hold breakfast in order to look around Takamatsu's old castle. Though there is very little left – due to destruction during the Meji era and World War 2 bombing raids – the outer walls did enclose a very nice garden which kept me entertained until the temperature rose. The garden was similar to the one I saw yesterday; beautifully pruned trees dotted around either a building of some sort, or a bit of water. As I roamed around I did see quite a few old men doing, what must be, their part-time job to top-up their pension. I could think of worse ways to earn a living and, maybe when I'm old, I might follow suit as it looked like a lot of fun. With the sun now high in the sky I went to Mr Donuts for breakfast and my first two drinks of the day. I then bought two bottles of water before heading to the ferry terminal. Today I wanted to visit Nao-shima – an island famous for it's 'modern art' – and Megi-jima – an island famous for a Japanese child's fairy story (Momotaro) which I know very well through my job. As I arrived at the ferry terminal I watched the ferry to Nao-shima depart. Once inside the ferry terminal, I discovered that the next ferry wasn't for another two hours however, there was a 'speed boat' option which left in forty-five minutes and took half the time to get to Nao-shima; this left from another pier. I also enquired about Megi-jima and was told that the other pier dealt with boats to that island too. I thanked the lady who'd been helping me and walked over to the other pier. No matter how hard I studied the timetables, there just didn't seem to be a way I could see both Nao-shima and Megi-jima AND get back to my hotel at a reasonable time. The reason for this is because both islands only have between three and five boat journeys per day. What is also annoying is that, even though the islands are on the same route (you have to go around Megi-jima to get to Nao-jima), the same boat doesn't serve both islands. I therefore decided to buy a 'speed boat' ticket to Nao-shima. Out of the two, this was the more important island and, at least, I could see Megi-jima from the boat. The ride was very, very beautiful. The water between Shikoku and Japan's main island is littered with small islands. Going through these was an absolute pleasure. I paid particular attention to Megi-jima and, before I knew it, I'd arrived in Nao-shima. Getting the 'speed boat' actually had it's benefits over the ferry. The speed boat dropped me off on the opposite side of the island to the ferry terminal. This side had the biggest village – Homura - and the most 'modern art'. I could look around here for an hour, before getting the shuttle bus to the village – Miyanoura - where the ferry terminal is located. I would then have forty minutes to look around Miyanoura before getting the 11:30am ferry back to Takamatsu. In any other temperature I wouldn't have bothered with the shuttle bus; the island is so small you can walk across it in twenty minutes. Homura is home to the 'Art House Project'; a large collection of houses with modern art in them. To see them individually cost £3 each or, a full pass could be bought for £12. Not being a huge 'modern art fan', - and lacking in time - I decided to just have a look at one piece. This piece consisted of a temple at the top – which was free to see – and a cave below (which you had to paid to enter). Once in the cave all I saw was the same line of steps I'd seen coming from the temple above. These steps were made of glass letting in some light into the cave. Through this piece I could instantly see what the artist was trying to achieve. He was trying to con innocent people out of £3! I mean … it was just a set of steps! Sure they were in glass however, as human beings, we've had glass for a pretty long time. What really annoys me about this 'modern art' stuff is that, if I made an exact replica of these 'glass steps', it wouldn't be called 'art'. This piece put me off seeing any others. Once I'd finished photographing Homura, I took the shuttle bus to Miyanoura. I bought a ferry ticket back to Takamatsu and looked around the small village. I saw a giant red pumpkin with holes it (no idea what that is suppose to 'express') before heading back to the air-conditioned ferry terminal. Once back inside the terminal I had a very difficult choice to make. There were two ice creams for sale; both were vanilla however, one was £1.50 more than the other. What made this ice cream special was that the ice cream was suppose to be smoother and the cone was suppose to be nicer. I'd seen it advertised around Japan before however, I'd never bought it due to the price. This time I went for it and the ice cream was really really good however, the cone was just a little too sweet for me. By the time I'd polished off my ice cream - whilst watching a bit of the Olympics – my ferry arrived. I sat next to a window. My t-shirt was soaked through with sweat and so, it was nice to sit within an air-conditioned area whilst looking out at the beautiful islands which lay before me and, occasionally, watching the Olympics on the TV. It took an hour for the ferry to dock in Takamatsu. My t-shirt had thoroughly dried out by then however, it didn't take it long to be all wet again. The time was 12:45pm and I was a little at a loss for what to do. I wanted to eat dinner around 3pm therefore, I had two hours and fifteen minutes to kill. I decided to look around the city of Takamatsu via it's massive covered shopping arcade. I stood, peering into the shops which had the best air-conditioning. At 2pm I'd gotten board of walking around. I wanted to dry my t-shirt before heading to a restaurant for dinner. I therefore went into a small shopping centre where I found a few chairs and tables. I was soon joined by an old couple however, I didn't talk to them much as I was reading my guidebook to make sure that I hadn't missed anything important – I hadn't. Finally at 3pm I said goodbye to the old couple and went to Ootoya for a lovely large meal. Once eaten I picked up tomorrow's breakfast, and supplies, from a convenience store. I made it back to my hotel where I had a lovely cold shower, relaxed, and went to sleep around 6pm. Tomorrow I will get up at 1am and hopefully leave Shikoku by 3am. I have thoroughly enjoyed my time on this small island and I wished that I'd had a couple more days (One more here, one in Tokushima and another in Kochi). Would I recommend people to come to Shikoku? Definitely however, if you are not bothered about seeing Tokushima's summer festival – it was good – then I would certainly recommend waiting for cooler climates (November time). I would also recommend crossing the road bridges to Shikoku during daylight hours as the view is beautiful. Sadly I won't see much on my return journey – I saw a lot of my journey coming here - but the quieter roads are just too much to give up for a good view. Nine years working for a local authority; Four and a half years achieving my degree; I've decided its time to see the world! This is my Flickr account where I store all my photos.